Made with wholesome ingredients such as dried fruit, nuts and asparagus root, the SunBar is a good source of fiber and soy protein. These wholesome ingredients assist in the body’s natural elimination process, and you get solid nutritional value without empty calories, sugar, or fat. They are full of healthy nutrition, kids just love them! We have a box of each in our cars just so the kids can snack on something healthy in between activities. We take the Sunrider Sunbars on hikes, bike rides, trips, to the gym to work out. Great before a workout! Not a heavy feeling like other “healthy” bars, Sunrider Sunbars have only 2-6 grams of sugar! Most other bars have 18!!! A Sunrider for 19 years, Business Leader Doreen Willerth from Canada recently completed the See Jane Tri Triathlon. This consisted of a 300-meter swim, 12-kilometer bike ride, and a 3.3-kilometer run. 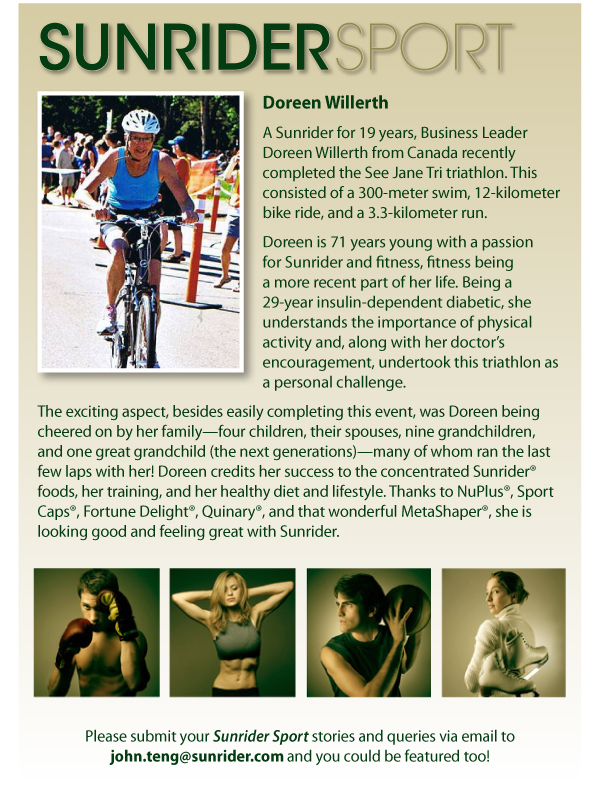 Doreen is 71 years young with a passion for Sunrider and fitness, fitness being a more recent part of her life. Being 29-year insulin-dependent diabetic, she understands the importance of physical activity and, along with her doctors’s encouragement, undertook this triathlon as a personal challenge. Be the first to review “SUNBAR” Click here to cancel reply.